It seems to have been great web weaving weather! First Allan had to be careful to avoid this web as he went to hang out the washing in the evening (he's a good fella, isn't he?!!). It was tricky getting the right focus and exposure on this. I had to resort to fully manual settings. 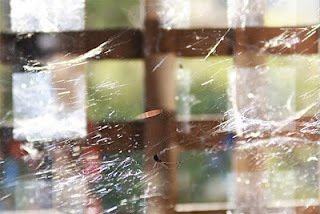 The last couple of mornings the sun has shone through the window in the garage and made the messy webs of the daddy long legs sparkle in the light. Looks like it's time to give the garage a bit of a clean! 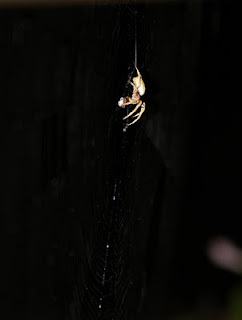 The next day I noticed this garden orb spider by our water tank. This time it was the setting sun that added a sparkle to the web. 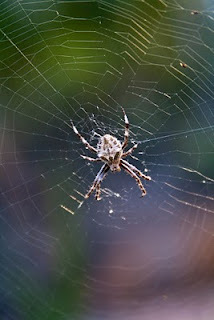 Luckily these spiders are all quite harmless and we only need to suffer the inconvenience of their webs. I'm sure I could find some lovely poisonous redback spiders to photograph, but I'm not particularly keen to get close enough for a macro shot! Well, I'm updating this to post a photo I just took! 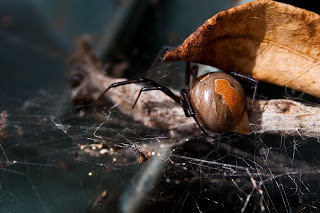 I'm a bit of an arachnophobe, so Esther, whilst I appreciate the brilliance of your macro photography, I have no desire to get anywhere near these babies. Eeeeeek.